Hi everyone, here are our recommended titles for the week. 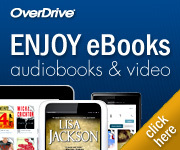 This list includes ebook titles, available through OverDrive and, five print titles available through StarCat. A landmark volume in science writing by one of the great minds of our time, Stephen Hawking’s book explores such profound questions as: How did the universe begin–and what made its start possible? Does time always flow forward? Is the universe unending–or are there boundaries? Are there other dimensions in space? What will happen when it all ends? Told in language we all can understand, A Brief History of Time plunges into the exotic realms of black holes and quarks, of antimatter and “arrows of time,” of the big bang and a bigger God–where the possibilities are wondrous and unexpected. With exciting images and profound imagination, Stephen Hawking brings us closer to the ultimate secrets at the very heart of creation. David and Caroline Connolly are swimming successfully through their marriage’s middle years—raising two children; overseeing care for David’s ailing mother; leaning into their careers, both at David’s university teaching job, where he’s up for an important promotion, and at the ad agency where Caroline has recently returned to work after years away while the children were little. The recent stresses of home renovation and of a brief romantic betrayal (Caroline’s) are behind them. The Connollys know and care for each other deeply. From the New York Times bestselling author of The Guest Room, a powerful story about the ways an entire life can change in one night: A flight attendant wakes up in the wrong hotel, in the wrong bed, with a dead man – and no idea what happened. Cassandra Bowden is no stranger to hungover mornings. She’s a binge drinker, her job with the airline making it easy to find adventure, and the occasional blackouts seem to be inevitable. She lives with them, and the accompanying self-loathing. When she awakes in a Dubai hotel room, she tries to piece the previous night back together, already counting the minutes until she has to catch her crew shuttle to the airport. She quietly slides out of bed, careful not to aggravate her already pounding head, and looks at the man she spent the night with. She sees his dark hair. His utter stillness. And blood, a slick, still wet pool on the crisp white sheets. Afraid to call the police – she’s a single woman alone in a hotel room far from home – Cassie begins to lie. She lies as she joins the other flight attendants and pilots in the van. She lies on the way to Paris as she works the first class cabin. She lies to the FBI agents in New York who meet her at the gate. Soon it’s too late to come clean-or face the truth about what really happened back in Dubai. Could she have killed him? If not, who did? In 1940, David Sparsholt arrives at Oxford, his sights set on joining the Royal Air Force. Handsome, athletic, charismatic, he is unaware of his powerful effect on others—especially on Evert Dax, the lonely and romantic son of a celebrated novelist who is destined to become a writer himself. With the world at war, and the Blitz raging in London, Oxford exists at a strange remove: a place of quiet study, but also of secret liaisons under the cover of blackouts. A friendship develops between David and Evert that will influence their lives for decades to come. Hollinghurst’s astonishing new novel evokes across three generations the intimate relationships of a group of friends brought together by art, literature and love. We witness shifts in taste and morality through a series of vividly rendered episodes: a Sparsholt holiday in Cornwall; eccentric gatherings at the Dax family home; the adventures of David’s son Johnny, a painter in 1970s London. With tenderness, wit and keen insight, The Sparsholt Affair explores the social and sexual revolutions of the past century, even as it takes us straight to the heart of our current age. Nashville, August 1920. Thirty-five states have ratified the Nineteenth Amendment, twelve have rejected or refused to vote, and one last state is needed. It all comes down to Tennessee, the moment of truth for the suffragists, after a seven-decade crusade. The opposing forces include politicians with careers at stake, liquor companies, railroad magnates, and a lot of racists who don’t want black women voting. And then there are the “Antis”–women who oppose their own enfranchisement, fearing suffrage will bring about the moral collapse of the nation. They all converge in a boiling hot summer for a vicious face-off replete with dirty tricks, betrayals and bribes, bigotry, Jack Daniel’s, and the Bible. Following a handful of remarkable women who led their respective forces into battle, along with appearances by Woodrow Wilson, Warren Harding, Frederick Douglass, and Eleanor Roosevelt, The Woman’s Hour is an inspiring story of activists winning their own freedom in one of the last campaigns forged in the shadow of the Civil War, and the beginning of the great twentieth-century battles for civil rights. Wrapping up a normal day at the office, criminal psychologist Kieran Finnegan is accosted by a desperate woman who shoves an infant into her arms and then flees, only to be murdered minutes later on a busy Manhattan street … Kieran can’t stop thinking about the child and the victim, so her boyfriend, Craig Frasier, does what any good special agent boyfriend would do– he gets the FBI involved … Kieran won’t sit idle when a lead surfaces through her family’s pub. Investigating on her own, she uncovers a dangerous group that plays fast and loose with human lives and will stop at nothing to keep their secrets. In a 2017 survey, presidential historians ranked Dwight D. Eisenhower fifth on the list of great presidents, behind the perennial top four: Lincoln, Washington, Franklin D. Roosevelt, and Teddy Roosevelt. Historian William Hitchcock shows that this high ranking is justified. Eisenhower’s accomplishments were enormous, and loom ever larger from the vantage point of our own tumultuous times. Next Next post: Freegal Music!